Storyboards are the key to coordinating sounds and visual animations. 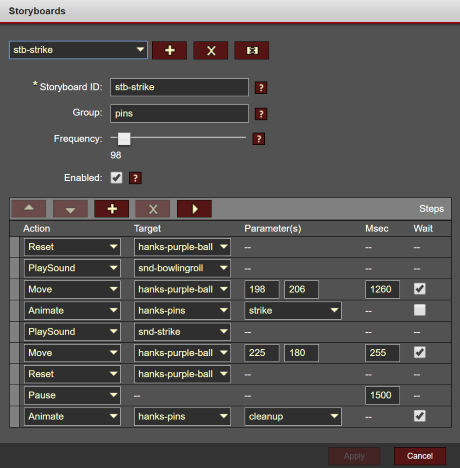 Here's a summary of the Storyboards editor. Storyboards essentially a sequence of actions, and most of those actions involve sounds, effects, and animations. You control the timing of the individual actions, including whether the storyboard engine should wait for one action completes before proceeding to the next. Runs an animation on the selected visual. Fades the selected visual in/out. Moves the selected visual to a specific X/Y position in the scene. Pauses the storyboard for the specified number of milliseconds. Reset the position and animation state of one (or all) visuals. Every few seconds, storyboards are eligible to be triggered as "flavor" for a scene. The Frequency value determines how often the storyboard is eligible to be triggered. Setting the Frequency to 0 means it'll be manually triggered via scripts, whereas a frequency of 1000 means it'll be played continuously.